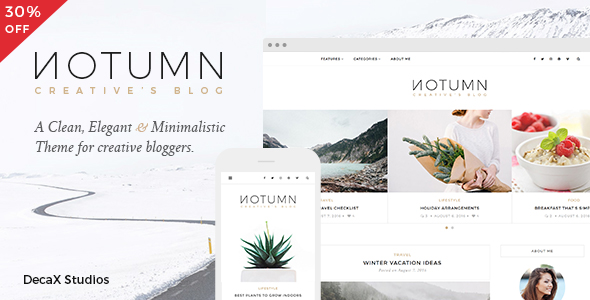 Notumn is a Clean, Elegant and Minimal WordPress theme specially made for creative bloggers. It provides clean, clutter free and gorgeous minimalistic layouts that make your content look great on any kind of device. It is ideal for personal, fashion, photography, travel, lifestyle, food and magazine blogs etc. Featured Posts Slider allows you to display either popular or featured posts on the homepage. 2 Featured/Popular Posts Slider layouts. Noutmn is built with the new responsive images in mind, our theme is responsive from the core and fully embraces the responsive images to make your content look sharp & crisp on any device. The theme is profiled and optimized to load faster. All images are lazyloaded. Noutmn comes with fullscreen lightbox with heavy features like slideshow, zoom & animations etc. Customize your site and see the changes in effect on the fly without disturbing your live site. Social Sharing buttons on posts and pages. To help you easily create logo & profile picture, 2 PSD generator files are included in the theme. Note: All the stock images used in the demos are not included in the theme. + Improved Main Menu layout. + Minor improvements and bug fixes. + Added: Static Front Page Support. + Improved: Various Layout Improvements. + Fixed mobile navigation expand issue. + Added: Light Gallery Support for JETPACK Galleries. + Improved: Live Customizer Settings. + Updated: Functionality Plugin updated to v1.0.2. + Improved: Minor CSS Style Edits. + Updated: Functionality Plugin updated to v1.0.1. - Fixed: Broken feed images issue has been fixed. + Improved: Replaced DOMDocument with DiDOM. - Fixed incorrect template name of child theme. - Minor code improvements and bug fixes. + Improved Responsive Images Processing. - Fixed: Body text encoding issue. - Fixed: PHP empty function bug for older PHP versions. - Fixed: Grid Posts Auto Height bug.